The farmer's marketing has had beautiful zucchini blossoms for several weeks now and every time I see them, I make a note to buy them but I am always hesitant to purchase them unless I know I'll have time to make them right away. They are so beautiful (but fragile) and they deserve to be eaten right away while "just picked." If they weren't quite so ephemeral, I'd put them in bud vases and decorate the dinner table with them. My favorite way to eat them is stuffed with some fresh mozzarella and basil and fried in a light batter. It seems to bring out their flavor and still preserve their interesting form. It's also quite a crowd-pleaser. The recipe is quite simple. Be sure to make them only moments before you plan to eat them: they are quite fragile and won't hold their shape long. Combine milk, flour and egg. Heat oil in a medium saucepan until a droplet of water crackles vigorously when dropped in. While oil is heating, place a small chunk of mozzarella and a piece of basil in each blossom. Gently twist tops to seal as best you can. Dredge blossoms in batter a few at a time. Allow excess to drip off. Fry a few at a time for several minutes until blossoms turn golden brown. Cheese will melt on the inside. Remove gently with a slotted spoon. Drain on paper towels. YUM! This is a real treat and your recipe sounds easy & delicious. Thanks! 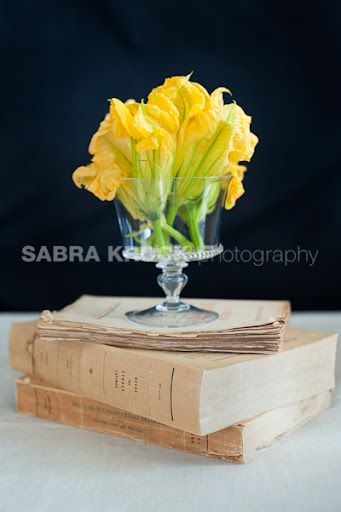 I looked for zucchini blossoms at the farmers market most of the summer and never found any. I really want to try them fried! They sound wonderful. Absolutely gorgeous photographs. 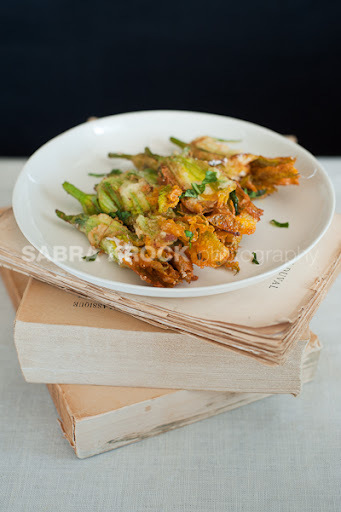 Fried zucchini blossoms are one of my favorite foods -- they're just so light and crispy and indulgent. I've been looking for some blossoms at the farmer's market but haven't seen any. I'll have to try again this weekend. Everything you do is so so lovely. You do what I wish I had time to do with photos (and talent and equipment.) It's always my pleasure to visit here. Chris: that's so interesting! Is it because you have young plants? One Ordinary Day: that's strange that your farmer's market hasn't had them. You might also try an Italian specialty store or gourmet store. It's getting toward the end of the season so hurry! Thanks re: the blog. I'm still living with it and tweaking so if you have any suggestions, let me know. Thank you very much Angela! It comes at the expense of not posting as frequently as you do - but it's worth it if you always find something that delights here! I love how delicate and crunchy at the same time these look. Just beautiful.